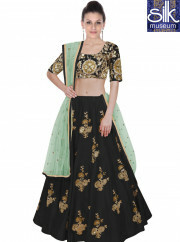 This gratifying brown art silk designer lehenga is beautify with patch border work and sequins work designed keeping latest trends in mind. Style and trend would be on the peak of your elegance the moment you dresses up. Note - Maximum possible bust size: 42 inches.